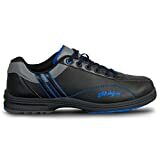 The Strikeforce Men's Raptor bowling shoes are performance shoes with the ability to interchange the slide pad and heel on the left shoe for right-handed bowlers. The technology put into this shoe was designed with performance and comfort in mind. Soft, durable microfiber upper. STA-DRY™ Open Mesh tongue and collar for maximum breathability. Thermal Poly-Urethane outsole that is extremely flexible. Minimal break in time required. Interchangeable slide pads and heels on both shoes. Innovative H-Bar heel locking system. Interchangeable slide pads and heel on the left shoe only. Genuine Clarino #8 white microfiber slide pad. Right Hand Only.